It is well known that photographers do love some gear chat. In fact I get far more questions about my (backpacking) gear than about anything else photography-related. Hence, I have decided to spend some time writing what gear I take with me when backpacking in the mountains of the Scottish Highlands. I know that gear lists can be very boring, but it might make a nice change from the endless string of trip reports I have been writing here on the blog. There’s even the possibility that it might be of some use to people, and that it might help encourage other photographers to give wild camping a whirl (where permitted of course). A lot of my photography, especially over the last year or so, is done in places where contour lines are virtually touching each other on even the most detailed maps. In the majority of cases this is taken while wild camping either on ridges or summits in the Scottish mountains. This approach has a lot of benefits for landscape photographers, besides that wild camping is food for the soul. For instance, camping at higher levels is often the only way to ensure being on a prime location at either sunset or sunrise, when light is generally but not always of desirable quality. A hike in (or out) would take many hours, which does not look appealing to me at best, or could be dangerous at worst. In addition, backpacking means that the pace will be slower, and there’s generally more time to just admire the view or wait for conditions to change, such as that cloud to lift, or those sunbeams to lit that specific patch of moorland.. As a consequence, even if sunset is a non-event, high level camping gives us poor photographers a second chance at that magical golden hour light. A lot in landscape photography depends on luck, so by increasing the time spent on location, we can maximise our chances of catching one of those rare fleeting moments of divine light. Wild camping means waking up to views like this. No hotel or cottage can rival this! Of course, it’s not all singing and dancing when it comes to camping in the mountains. A lot of gear will need to be carried uphill and sometimes over challenging terrain, and because of the inevitability of the laws of gravity, this will lead to increased fatigue and consequently danger, as slips and trips are more likely. Of course, one can somewhat counter-act this by exercising more and losing excess weight, but with most of us busy juggling family life with work, there’s a limit to how effective this approach is. I’d argue that rucksack weight is especially problematic for landscape photographers when heading to the mountains. On one hand because camera gear weighs a lot, and on the other hand because landscape photographers are more likely to sit (or stand) still for prolonged amounts of time than the average hillwalker, which will mean more clothes to keep you warm. The load can be reduced by buying lightweight material (which is an expensive path to follow), or by assessing carefully what gear to take with you. 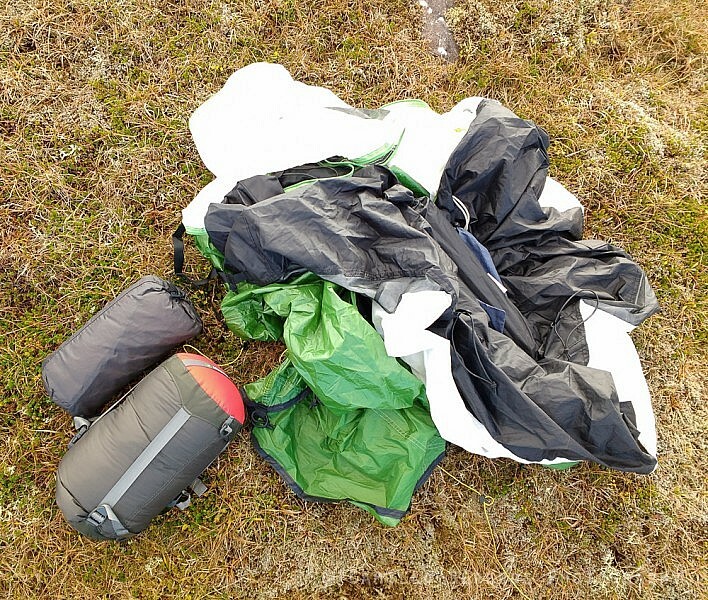 I say carefully, as it’s easy to drop weight from the pack load by using a sleeping bag which isn’t warm enough, or by leaving waterproofs at home. Clearly, a balance has to be struck between safety and weight. And as this balance depends on the weather conditions (which may or may not turn out according to the forecast), it is impossible to get it perfectly right, but we can at least try. Eventually, as a combination of the inevitable kit upgrades and working out what kit to leave behind, packlists will naturally change from trip to trip and hopefully get closer and closer to that elusive weight-safety balance without . Please find below a list of gear I currently take with me when wild camping in the Scottish mountains, in all but the most wintry conditions. (EDIT March 2016: I have now also added a section of of more winter-specific gear further down.) None of the gear is perfect (there’s always better gear around! ), as often choices were made with a certain budget in mind, and sometimes because some equipment is just “good enough” for the job. Warning: This is by far my longest blog post. I hope the photographs sprinkled at strategic places will spice it up enough to help keeping you awake! The “big three” backpacking items are the rucksack, sleeping bag and pad, and tent or other shelter. They make up the most sizable proportion of total weight, and this is where major weight improvements can be made. At the same time this is also where small weight and/or performances differences can have a major impact on prices. I am for now reasonably content with my gear in this segment, it is not the most expensive kit, and lighter options exist, but per pound spent, weight can be shaved off for less on other bits of kit. I currently have a Wild Country Zephyros 2 Lite tent. It is affordable (<£200), relatively light weight (1.53 kg excluding pegs), easy to pitch, and well-built for British conditions. It has survived gale-force winds and I am confident using it in any non-wintry conditions you could imagine experiencing. It is marketed as a 2 person tent, but it is just big enough for me and my kit, (at 1 m 93 I am taller than average, so I reckon the size would be less of an issue for many others). Ventilation is probably not its strongest point, and the tent is probably a little more prone to condensation that I’d like. However, these are only minor gripes, and at this price this tent is hard to beat. I have replaced the pegs that came with the tent as they are useless. Instead I am using a mixture of MSR Blizzard stakes and MSR groundhog pegs, which are great for any type of soil you might encounter in the hills. Sleeping bag. I have a The North Face Blue Kazoo sleeping bag, which is a down sleeping bag with a comfort temperature limit of -2C. As it uses relatively cheap down (650 fill power) it is not the lightest sleeping bag in its class, weighing 1.3 kg for the extra-long version. I think its temperature rating is fairly realistic, as it has kept me warm when it was cold enough for my water bottle to freeze solid. It is overkill for warm summer nights (which are not too common in this part of the world anyway), but frosty nights are possible any day of the year at higher levels in Scotland, so I’d rather play it safe with a slightly warmer-than-necessary bag. I’ve had it for over eight years, and it is still going strong, but I will have to start looking for alternatives with a better warmth to weight ratio. Sleeping pad. I have settled for a Thermarest Prolite. It’s a self-inflating, doesn’t take up much space when rolled up, is insulating enough even below freezing levels, and weighs a mere 480 grams. In order to save weight I have settled for the regular length version instead of the long version even though it is shorter than me, but I usually use some spare clothes stuffed into a drybag as pillow so this isn’t too much of an issue. My current rucksack of choice is a Montane Grand Tour 70. With a capacity of 70 liters it’s big enough to fit everything I normally carry without any problems. Its main claim to fame is its weight, as it only weighs 1650 grams or so. While not as minimalist as some other options, it is stable and supportive enough for all that camping and photo gear. 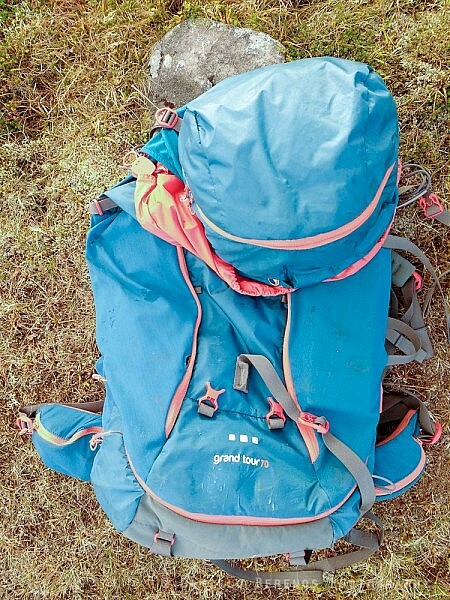 It’s made of lightweight material and as such I don’t think it is as durable as other heavier rucksacks, meaning that it will have to be replaced sooner than an equivalent sturdy rucksack. However, given its huge weight advantage this is a compromise that I’m willing to take. Top left: balaclava and hat. Top right: liner gloves, fleece gloves and windstopper gloves. Center: baselayers (x2), fleece jumper and waterproof jacket. From front to back: Wool socks (x2), softshell trousers, hard shell trousers. Lightweight breathable long-sleeved shirt. I have a few different ones, and there’s very little difference between them. I guess the main thing is that they’re not made of cotton. I mostly carry two. One for the walk, and a dry one for around camp. They don’t weigh that much anyway, and make life a lot more comfortable (and less smelly). Lightweight breathable boxers. 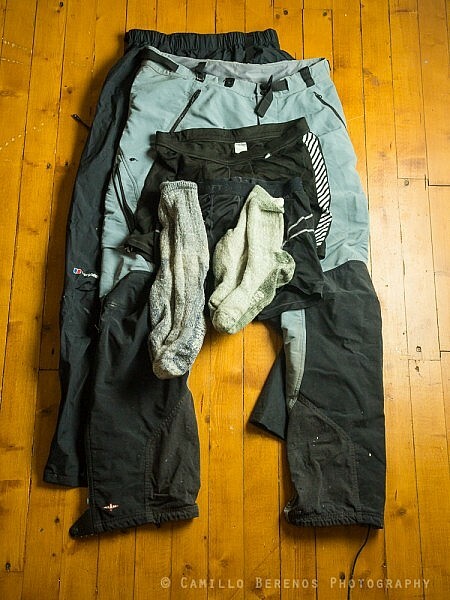 As with baselayer shirts, I often take two pairs. If temperatures are low, I might substitute one for a long john. Softshell trousers (Haglöfs). I have used several other trousers which are lighter, or better suited for really warm weather, but none of them survived very long. These trousers are simply amazing. They’re reasonably breathable, reinforced in strategic places, dry quickly when wet, and they’re made of stretch material meaning that there’s no constraints (other than fear of course) on movement when scrambling. A lightweight 100 weight Polartec fleece by Haglöfs. Lightweight waterproof trousers (Berghaus Paclite Goretex). They’re very breathable due to the Goretex material and 3/4 length zips, and are very compressable. I always take them with me, even when the weather forecast is favourable, as 1) we all know the weather forecast can’t be trusted, and 2) they’re great when sitting or kneeling down on mossy terrain. A Mountain Equipment Lhotse hard shell jacket made with Gore-tex Pro material. This is an absolute bombproof jacket. It has a great hood, comes with an emergency whistle, and the side pockets are positioned in such a way that access is no problem even with the rucksack hip belt in the way. Unless more lighweight options it is very abrasion-resistant, which is good if wearing it while carrying a heavy pack for an extended time. Wool socks (several brands). They are great, as they are warm even when wet. I take two pairs with me. It’s always nice to wear dry socks at the end of the day or when sleeping. Gloves (several brands). I usually take three pairs of gloves with me. Silk liner gloves, thin fleece gloves, and Windstopper gloves. These are usually fine, as they are warm when wet, but if the weather looks really atrocious I might take some Gore-tex mitts with me, which I can slide over any other glove I’m wearing. I’ve never needed to wear them all, but it’s always good to have a spare pair of dry gloves. I usually take a lightweight hat with me and a very thin liner balaclava. I wear leather (non-Gore-tex lined) walking boots (Meindl Borneo). They’re heavy, but keep my feet dry enough and are breathable. However, I am thinking of lighter alternatives. I love trail running shoes for general easy hillwalks, but not sure if I look forward to the lack of ankle support and having constant wet feet. Additional insulation. I often bring a synthetic Primaloft hooded jacket (Haglöfs Barrier) and/or a down vest (PhD Minimus). It can feel surprisingly cold on a mountain top, even in summer. 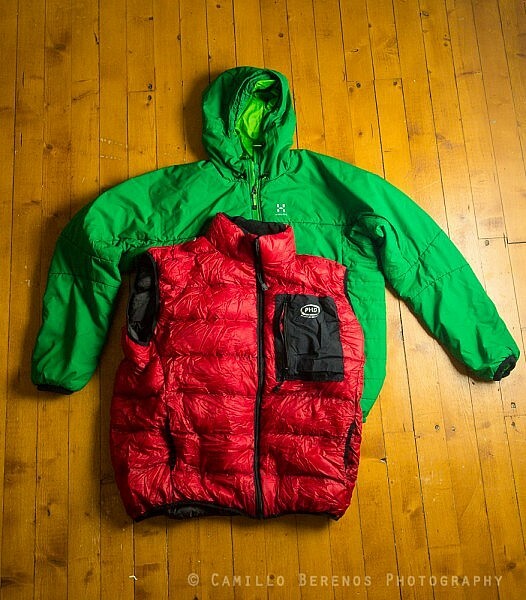 Additional insulation for colder days: Down vest and a Primaloft jacket. Ordnance Survey map (1:50’000) and compass. Essential bits of kit really. The map usually lives in an Ortlieb waterproof map case. Small first aid kit, travel towel, emergency whistle, a folding sit mat, Compeed blister plasters, watch, small Swiss army knife, Petzl Tikka XP 2 head torch, earphones, 3 spare rechargeable AAA batteries (Eneloop), spork, suncream, travel-sized deodorant, hand-disinfectant, toilet paper and a few baby-wipes (in ziplock bags), toothbrush and a small tube of toothpaste, small plastic bowl, glasses and glasses case, spare contact lenses, contact lens case and solution, sunglasses (not shown), bin bag for waste, trowel. A smartphone and a portable charger to charge my phone. Great to have as the phone can function as Ipod for evening entertainment. I also have some useful apps on it, such as a Grid Reference app which makes determining my position a lot easier. These, together with the car keys, usually go on the inside pouch of the top compartment of the rucksack and are kept (mostly) dry in a ziplock bag. A GPS watch (Garmin 310 XT). Not essential, but as I own it anyway, I sometimes bring it with me. It is nice to know how far I’ve walked already (or how far still to go). It has a battery life of 16-20 hours only, so not ideal for longer trips. I have a large drybag (50-60L) for all my dry clothes. A smaller (30L) drybag for camera gear, and another one of the same size for potentially wet clothes. A really small drybag for gloves and hats lives in the top compartment of the rucksack. One plastic wide-mouth (Nalgene-style) bottle. Sawyer mini water filter. It is extremely lightweight, affordable and should last a lifetime. I suppose that in Scotland it is generally safe to drink from running water at higher levels, but it’s great to be able to purify water on the go when in doubt. 2 Sawyer water pouches with a capacity of 2 liters each. They’re designed to connect to the filter and are extremely lightweight, and don’t take up any space when not in use. As there’s generally no access to water close to where I camp, I tend to fill these pouches close to or during the ascent, whenever I run into some streaming water. Miscellaneous but still important items. I’ve had an MSR Whisperlite stove for quite some time. It is a very popular liquid fuel stove, and rightly so. It is the kind of stove you’d take with you on an expedition, and it has been a great asset both in the Swiss Alps and here in Scotland. A key advantage of liquid fuel stoves is that, unlike with canister stoves, you don’t have to guess how much fuel you’ve got left, and you can take just the right amount of fuel with you, but it’s also environmentally friendlier as there are no canisters to dispose of and recycle. The Whisperlite is a fantastic stove, which is easily serviceable in the field, and has never let me down. However, it is reasonably bulky, quite heavy (if you add the weight of fuel and a pot), and takes a while to set up. The weight and bulk have started to become an issue for me as I was runnig out of room in my rucksack when backpacking solo, leading me to leave the stove at home when backpacking. The lack of hot food, tea or coffee was something I was willing to put up with for a while, but eventually I realised that the luxury of a hot meal was what kept me vaguely human. I now have a MSR Windburner, which is a personal stove integrating both a pot and a stove. It is extremely well insulated meaning that it is very fuel-efficient. It also takes no time to set up, and weighs very little while being much less bulky than the Whisperlite. It takes canisters, but using Primus Winter gas it has served me very well even in very low temperatures, both when melting snow and when cooking dinner. For the time being the Windburner will be my stove of choice when travelling solo. MSR Whisperlite including repair kit and pump cup oil (on the left) and MSR Windburner with a Primus winter gas canister on the right. A lighter is shown for scale. The difference in bulk is not so apparent here, but when taking the Whisperlite a pot needs to be brought too. I’d like to point out that this is just the gear I happen to have, mostly for pragmatic reasons. I have been shooting Canon since my slide film days, and financially it hasn’t made sense to switch systems however tempting some other systems might be. It is far from the best (whatever “best” is) possible kit, and Canon isn’t better than any of the other manufacturers out there. There are lighter options, f.i. mirrorless (Fuji and Sony, among others, produce excellent cameras in this class), options with better dynamic range (Nikon and Sony cameras tend to have sensors with a few stops extra dynamic range meaning that they are better able to retain detail in both shadows and highlights), and options with more megapixels exist too (Canon 5Ds/5DsR are full frame cameras with 50MP sensors, and of course there are always medium or large format cameras too). But I feel that this kit is a nice compromise between weight (using lenses with a maximum aperture of F4 instead of F2.8 which let more light through but are heavier and bulkier) and image quality. As with all the camping gear and clothing that is needed when backpacking, photography gear is ideally trimmed down to the bare essentials. My tripod for example is not an extremely stable beast, but it only weighs 1.2 kilos which is a big advantage. Only under the most windiest conditions does this trade-off affect image quality, and that is a trade-off I’m happy to live with as I try to stay away from summit camps in strong winds anyway. Of course, any decent modern camera can take great photos in the hand of a decent photographer, and gear is usually of least concern when it comes to landscape photography. The best camera is the camera you take with you, and you’re much more likely to take it with you if it doesn’t weigh a ton. 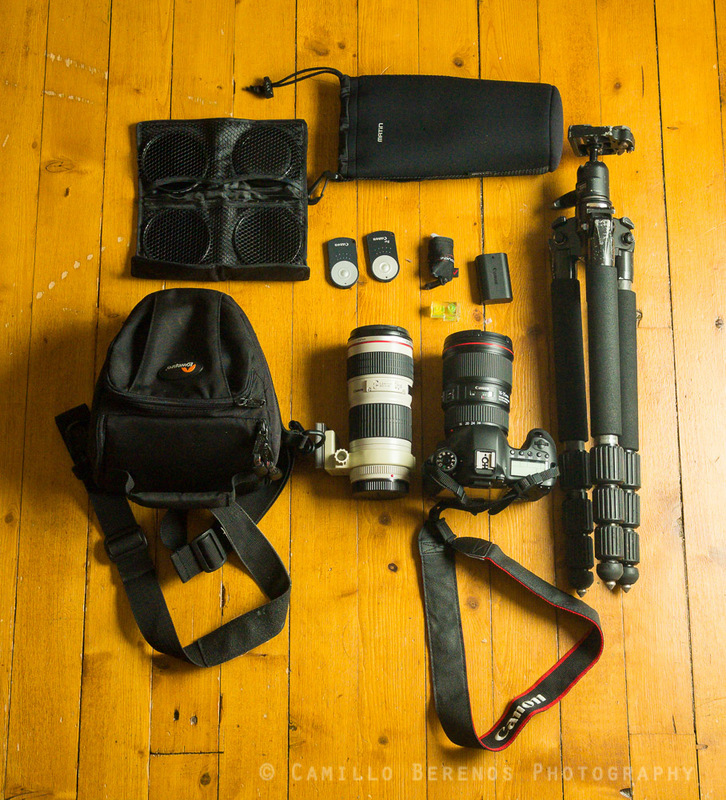 Top row: Filter wallet, lens pouch, wireless remote controllers (x2), spirit bubble, lens cloth, spare battery. Bottom row: camera bag, 70-200 lens, Canon EOS 6D with 16-35L lens. Right: Velbon tripod with Manfrotto head. Canon EOS 6D, a 20.2 MP full frame camera. A Canon 16-35 F4 L IS lens. As it is an L lens, it is very robust, and for a zoom it has excellent optical quality. It is also image stabilised but I rarely use that feature as I almost exclusively shoot using a tripod. For the type of photography I do, having a wide-angle is essential. A Canon 70-200 F4 L IS lens with tripod collar (non-branded, Ebay). This is a fantastic lens to pair with a wide-angle, and I find myself using it more and more to take detail shots of mountain peaks. There is a bit of a gap between 35mm and 70mm, which isn’t ideal, but I don’t think I miss it enough to take my 24-105F4 L or a 50mm prime with me up the hill too. Less gear equals less worries! And I can always create a panorama from several photos shot at 70mm if necessary. As with the wide-angle, the long zoom is essential for my style of shooting as it allows me to see past the vista-type shots and fuels my creativity. A Velbon Neo Camargne 540 carbon fiber tripod. It is lightweight, relatively sturdy for its weight, and easy to service at home. I’ve had it for 9 years and it is still almost as new. Not the sturdiest tripod out there (somewhere in between a Gitzo 1 and 2 series in terms of specs) but I rarely extend all four leg sections anyway as I like to get close to the ground when shooting with a wide-angle lens especially. A Manfrotto 494 ball head. Lightweight and very affordable. No tension control, and ball-heads make very precise compositions more difficult than geared heads or three-way heads, but the improved usability comes with a weight penalty. I bring a circular polariser (Hoya, I rare use this one, but it is a good substitute for a 2 stops ND filter), and both a 6 stops and 10 stops ND filter (both B&W). All filters are in 77mm size. I also bring a 77-67 step up ring to fit these filters to the 70-200 lens. Filters and step-up ring are kept in a filter wallet. Two wireless remote controllers (non-branded, bought on Ebay, inevitable to prevent camera shake, and two as they get lost easily), a hot shoe spirit level (to get those horizons level), lens cloth, and one or two spare batteries (Ex-pro brand) are usually enough for trips up to two nights. The tripod is strapped to the side of the rucksack, and my photo gear usually lives in a Lowepro Toploader Zoom 1, with the exception of the 70-200 lens which lives in a neoprene lens pouch. Both go in a drybag at the top of my rucksack, or I carry the Toploader bag on my chest for quick access by fitting it to the rucksack shoulder straps with carabiners. So far, I’ve listed the gear that I take with me from spring until autumn. Temperatures might drop below zero in this time, but usually not by much and there’s little, if any snow on the hills. 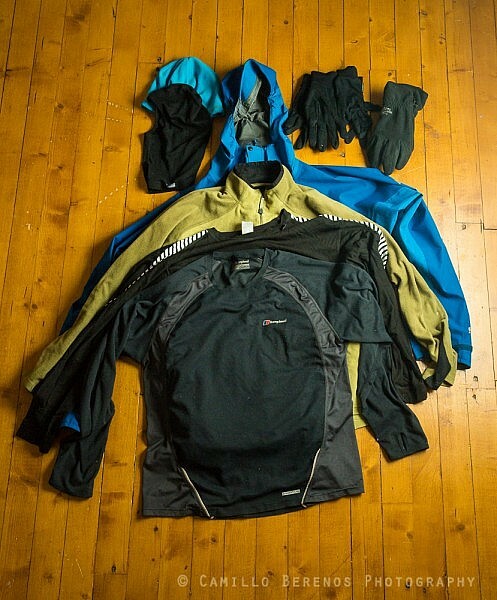 When snow arrives and temperatures plummet, I carry (even) more gear, and replace some of my three season gear with gear that is better equipped to deal with the cold. Of course, given the fickle British weather, it can be warmer in winter than in spring or even summer, so as usual the conditions at the time will determine what I carry, but in general is unavoidable that pack weight is substantially increased. In winter it’s always wise to err on the side of caution when deciding what to bring to avoid hypothermia and even frostbite. 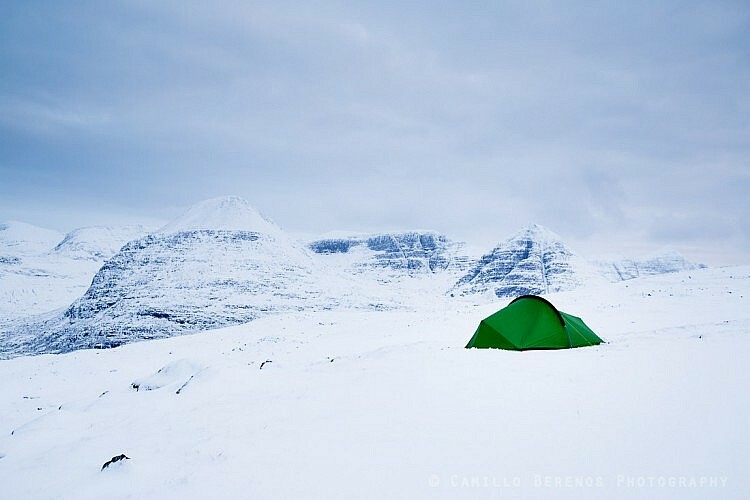 Here I was camped high in the wintry hills in Torridon. In conditions such as these, far from civilisation and being on your own, it’s pivotal to have gear that can adequately deal with the conditions to stay safe. Grivel G10 crampons. As the name eludes to, these have 10 points and are C1 rated crampons. They are not suited for climbing, but serve me well for most gradients and conditions encountered as a winter hillwalker. Grivel Munro ice axe. This is a very affordable no-frills ice axe but it’s lightweight, and good enough to cut steps, self-belay and ice-axe arrest (if needed). La Sportiva Nepal Trek boots. I’ve had these for almost 10 years, and they’re still going strong. The soles might need replacing now, or I might consider buying a new pair, but boot shopping for size UK13/EU48 is never fun. Winter clothes and sleeping gear. I mostly carry the same gear in winter as outside winter, as the layering priciple still applies. The major exceptions are the sleeping bag and mat, which are replaced by ones which provide far more insulation, and additionally there are a few more minor changes cmpared to summer. Mammut Winter UL Sphere on top of a Thermarest Neoair Xtherm. A Therma-rest NeoAir Xtherm. This is an extremely insulating sleeping pad (R value of 5.7) and is even lighter and less bulky than my summer pad. I might consider bringing this one all year long now. 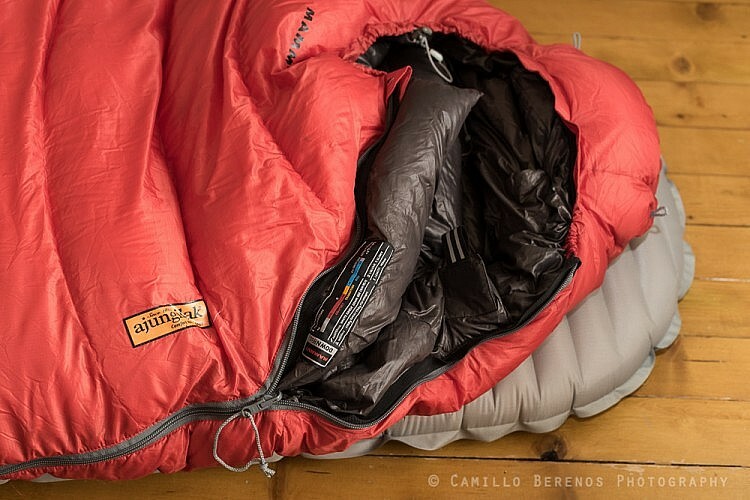 A Mammut Sphere UL Winter sleeping bag. This is a fantastic bag with 680 grams of high-loft (800 fill) down and has a comfort limit of -11 °C for men. It is also big enough for me, which is a bonus as many sleeping bags are not suitable for tall people. As with the pad, it is also lighter and more compressable than my summer bag, so I might bring this one all year (or replace my summer bag with a lighter version if I have some spare cash). The combination of this sleeping bag and pad has kept me very toasty at temperatures of -10 °C just wearuing base-layers, so I have no doubt that this will serve me well for most winter conditions I typically dare to venture out in. Montaine Prism booties. Very lighweight booties filled with Primaloft. After a long day it’s nice to take off the boots and wet socks, put on some dry socks and wear the booties in or near the tent. A lucxury item, but oh so comfortable. A lot of gloves. For an overnighter I typically carry two pairs of liner gloves, a pair of fleece gloves, two pairs of soft-shell gloves (Montane Powershield Grip and North Face windstopper) and a pair of insulating mitts (Montane Extreme). Warmer baselayers. I usually wear a thin long john (Rab Dryflo 120) and carry a warmer one to wear in the evenings (Rab Power Stretch). As headwear, I bring a beanie, and a liner and windstopper balaclava. Gaiters (Outdoor Research Crocodiles). I don’t normally wear them in summer as I tend to overheat when wearing them, but they’re essential to keep snow out of the boots. Ski goggles. These are essential when out in windy conditions when there’s a lot of spindrift, or in blizzards. So, if you’re still reading: Well done! 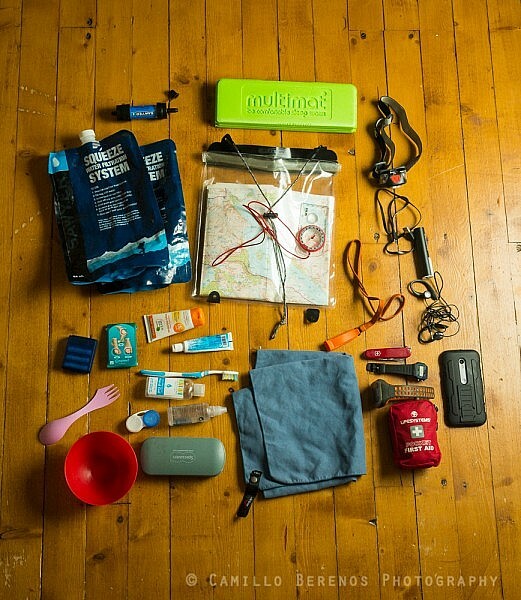 This turned out to be a behemoth of a post, but I think it is a relatively representative list of things I take with me for three-season use. I am aware that my gear list is very much Scotland/Britain-biased, but that’s where I happen to most of my backpacking at the moment. Gear choices should always reflect the local conditions, and are subject to personal preferences, so what works for me might not necessarily work for others. Please feel free to share your thoughts below, I’m always open to suggestions and/or questions! If you’d like to see more of my photographs, my portfolio can be found here and my most recent work can be seen here. Prints can be purchased here. All the items you have are essential. I personally would add crampons and an ice axe for winter walking, though one rarely needs them due to the mild Scottish winters. I would recommend a Garmin GPSmap device. It does not have to be the latest model, mine is 5 years old. But they are very reliable, work in all conditions, and having an OS map on them you always know where you are and where you need to go. I always have it with me as I am usually by myself. It gives me quite a bit of comfort and without it I would have had to turn around a few times due to poor visibility. 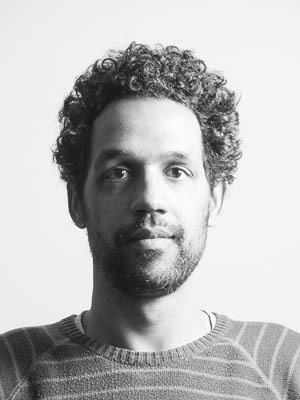 Am loving your blog, keep up the good work. Very inspiring stuff. Thank you very much for reading and taking the time to comment. Much appreciated from a fellow mountain photographer. Yes, you are completely right about the crampon and ice axe, I always take them with me if there’s a slight chance of needing them. I have left it out here as the gear list was more of a three-season gear list. I will likely amend this during/after this winter, as I need to get a better sleeping bag for true winter conditions anyway. Thanks for the Garmin GPSmap suggestion. I know I need to get one, and I’ll look into it, it’s always good to have one in case of a white out, or when a fatigue-induced brainfart occurs! And like you, I always hike alone now, so it’s probably wise to be extra precautious! I read your blog article with great interest and will revisit it quite a few times over the coming months. AS you know, I picked up nature and landscape photography last year after a lifetime of sports photography. I also started to climb some of our mountains and managed to bag a few munroes as well. I love to get the unique shot and as you will be aware, most togs will swarm all over roadside locations but there aren’t a great deal that venture into the hills to get their shots. I really love viewing all the shots from the hills/mountains and my goal for next year is to start on the wild camping to get the benefits of sunset and sunrise the following day and to get some unique shots. Thank you very much for reading and commenting, I am glad you enjoyed it. 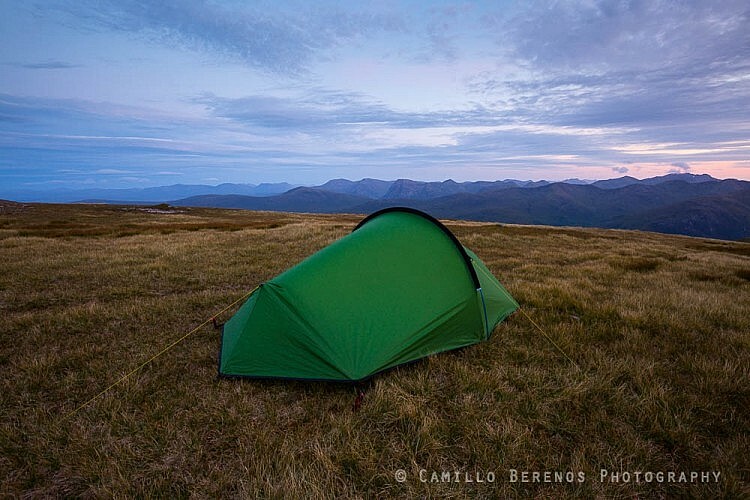 Indeed,besides being a great way to connect with nature, wild camping is the best means to get decent photographs in more remote or upland areas. I hope you will manage to give it a try next year, it is very addictive! I am glad you found the gear list useful, and hope that Santa is kind to you this year! I’m looking into doing the same, but one thing I’m not sure of in your article, how exactly did you attach the tripod to the side of your rucksack? Thanks very much for reading and the kind words. I attach the tripod to the side of the rucksack using straps. I have now made it clearer in the blog post. Thanks very much for stopping by Domenico. Sitting upright inside the tent is a little uncomfortable for me. I have cooked in the porch while lying down in my sleeping bag. I had the zippers open to avoid condensation and the risk of fire though.